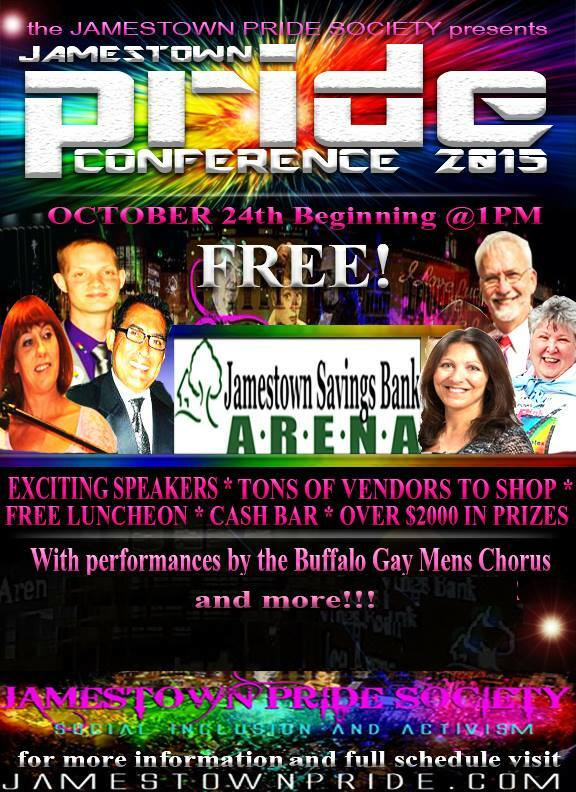 The Jamestown Pride Society Presents the Second Annual Jamestown Pride Conference to be held Saturday October 24th, 2015 at the Jamestown Savings Bank Arena! This event is FREE, and has something to do all day. Starting at 1pm and going all day and night, the event features amazing musical entertainment with bands, singers and dancers, educational keynote speakers touching on topics regarding GENDA, Anti-Conversion Therapy/ Anti-Bullying as well as Health and Human Services who will include government leaders, community leaders and activists. There will be a free luncheon, over 30 local vendors and organizations with Arts, crafts, food, gifts, jewelry, toys and more! Raffles will be held throughout the day with prizes worth over $2000 from gift baskets and 50/50′s as well as one GRAND PRIZE DRAWING! A cash bar will be available. This is an all ages event and everyone is welcome! For more information, speaker biographies, a list of vendors and entertainment as well as a full schedule, please visit jamestownpride.com. The Jamestown Pride Society hosts the second annual Miss Gay Chautauqua County Pageant in affiliation with the Imperial Court of Buffalo following the Jamestown Pride Conference Saturday October 24th, 2015 at the Jamestown Savings Bank Arena. Starting at 7pm, the event highlights the most talented entertainers in the tri-state area as well as contestant competition to be the next symbol of excellence for the LGBT community in the county of Chautauqua. Honoring the reign of Miss Gay Chautauqua County 2015 Veronica Lace, the event features four categories. Creative presentation, evening gown with on stage question and talent! The society will also be presenting the 2015 lifetime achievement award! Following the pageant will be the MASQUERADE BALL featuring a dj playing the hottest music all evening, including a costume contest at midnight with a $50 cash prize! There is no cost to attend, a cash bar is available, and food can be purchased throughout the night. There will also be a 50/50 drawing! For more information, visit jamestownpride.com.